I wanted to thank those that began following me. I got the notifications and I was happy and a bit surprised to get followers 🙂 I appreciate you giving me some sense of fulfillment haha. So I feel myself starting to lose interest in planning my meals. The first week I was all about it, looking things up and writing down the recipes and all. The second week I looked everything up but I was getting easily frustrated with having to write things down and looking up more recipes. This week I looked up some recipes but I haven’t actually laid anything down for the week. My mother-in-law did the cooking this weekend (thank God) and I took a break from the kitchen. But I am determined to keep this going. I have showed a sort of interest in making soups this season and am ready to try many of them. But that is yet to come, I still have another week or so before I want to start just because I want the weather to be absolutely perfect for the soup. So this week, one of the days I made my boyfriend his lunch, I made him something simple yet yummy. 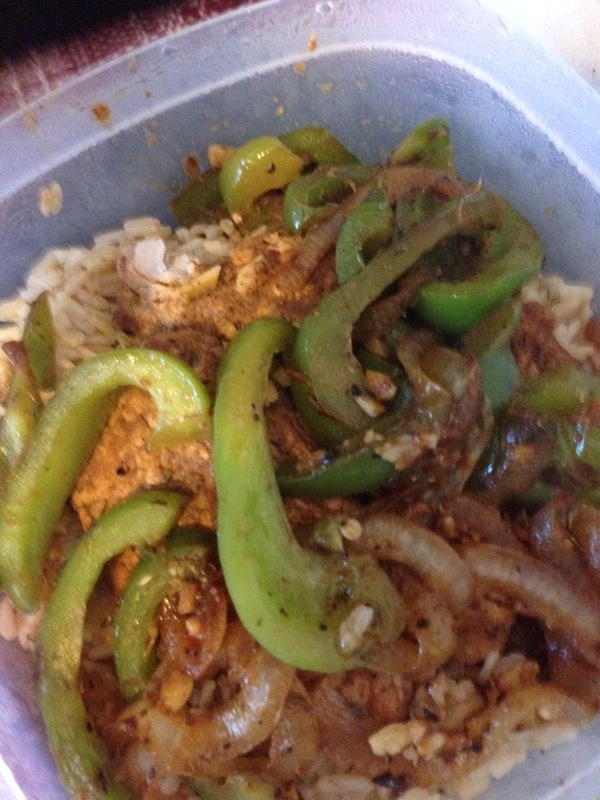 I made him some pork tenderloins with green peppers and onions over some brown rice. What I invented for this part was the marinade for the pork. I honestly winged it and when I finished I was a bit scared of how it would come out but when I tried it, I whooped for joy because it came out great and the pork tasted awesome. I mixed some deli mustard with some balsamic vinegar, olive oil, salt/pepper, cumin, some chili powder and a bit of lemon juice and let the pork sit for about an hour or so while I made everything else. I boiled the brown rice with some salt and white vinegar. I sauteed the onions and green peppers with some olive oil. When the onions and peppers cooked for about 3 minutes I added some salt and some chili powder. After about 2 more minutes, I added 2 cloves of garlic. I finished cooking the peppers, allowing them to soften. Once they were done I moved them to a plate to make way for the pork. I sprayed the pan with some Pam and put the pork in and let it cook. Once the pork was cooked, I added the peppers and onions back into the pan and let it sit for a while. With the rice that was left over I did something different. I used the same pan I had used for the pork and the peppers because it had all the seasonings and yummy stuff the meat leaves behind when it cooks. 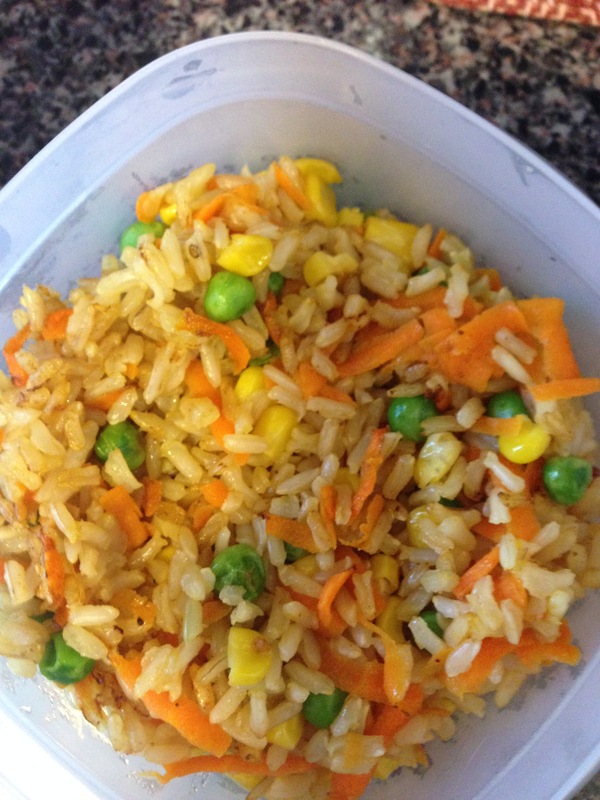 To the pan I added corn, peas and shredded carrots. I added some salt and pepper, a bit of water just to cook the veggies more thoroughly. Once the veggies cooked nicely, I added the rice and mixed it all up and let it sit for a while longer. I ate the rice with some turkey and it filled my stomach nicely 🙂 this rice can go with almost anything, you can make some nice grilled chicken, or some tuna would be nice. As you can see, my made up recipes don’t really have measurements or time intervals. I really just throw things together to my liking and go from there. When you are not measuring always start with as little of a spice as you can and move up from there if it needs more, my mom always used to say, you can always add more but you can never take any away. So just be careful. On that note, I hope everyone has had a beautiful Monday 🙂 I hope you enjoy the rest of your week! Yes it does. I was never real a rice eater (which is weird because I’m Hispanic), but since I’ve seen how versatile it is, I have become one.